Perfectly adapted to its tropical environment, Casa Mecano by Robles Arquitectos sits tall and proud on Costa Rica’s Península de Osa. It feels like the surroundings of this sustainable home contribute to its overall appearance. Architects designed the roof to be reminiscent of a sail, encouraging the owners to manipulate its inclination according to the amount of sunlight needed. Site-specific architecture has blessed home owners with the thrill of enjoying wonderful views of their surroundings while living comfortably in modern dream homes. A home without a view relies on its own interior design to compose a cozy living space, but those residences boasting fabulous panoramas surprise the essence of modern living. 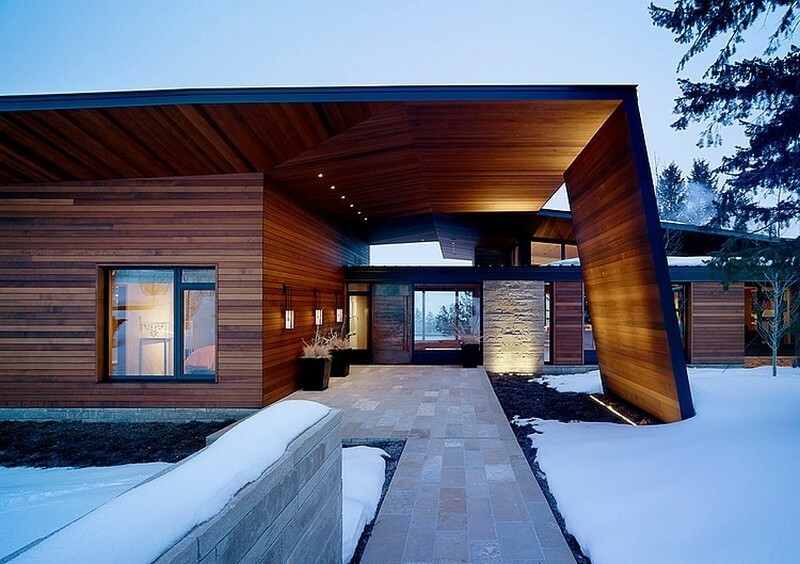 Spectacular landscapes make for amazing dream home settings. The Fall House in Big Sur, California sits tall as to prove that a rough environment with a 250-foot drop to the Pacific Ocean is the perfect vacation retreat, boasting a clear glass facade overlooking the ocean. Inspired by the carefree camping feeling, this modern Beach House by Crosson, Clarke, Carnachan Architects boasts a design adapted to its coastal location. Opening its interiors to the relaxing atmosphere outside, interior spaces are exposed to the calm breeze and visually connected to the holiday-inspiring surroundings. If you’re looking for a way to combine chic building materials and natural surroundings, you might just stumble upon a stunning setting where a contemporary residence can creatively become part of the scenery. Take House Lombardo as example: an imposing residence right above Lake Lugano in Switzerland. Philipp Architekten designed this home with a 270 degree panoramic view over the lake and, according to the architects, “under favorable weather conditions you can even spot Milan”. This eco-friendly home settled over the weald of Kent has stunning, panoramic views from almost every room. Floor to ceiling windows and doors show a priceless view of the town below and over 3,400 square feet of living space make this home exceptionally grand. 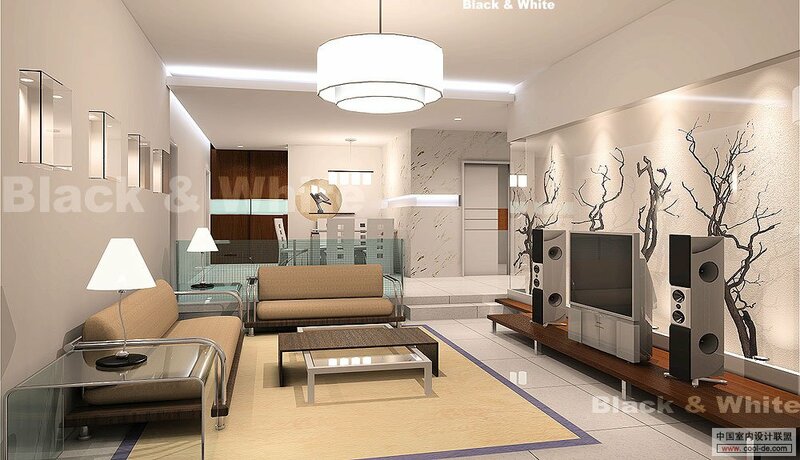 The design of the home is monochromatic featuring just white and black with some chrome touches throughout. The only slight splashes of color are in the accent pillows and fresh flowers. 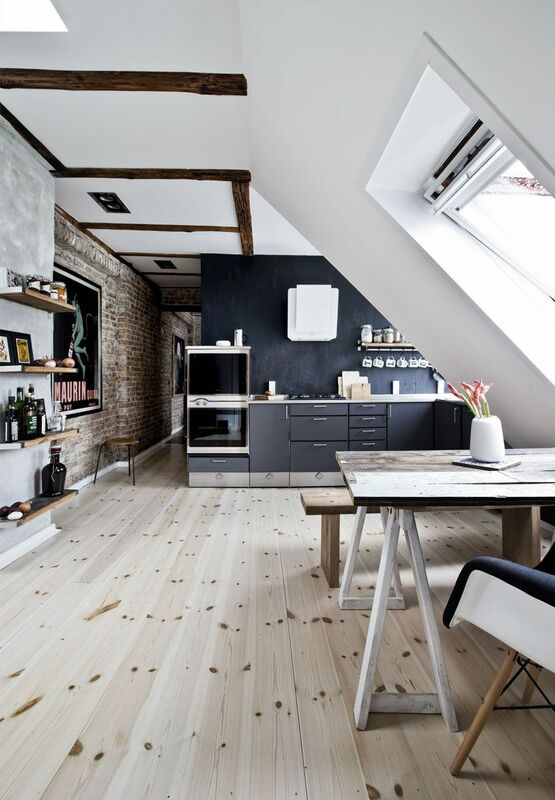 The color scheme makes for a lavish design without going over the top with color. The outside of the home is again white with linear architecture. It almost looks like an office building with the flat roof and thin glass paneled windows in the front. The tarmac also provides a large amount of parking space and yet there is also underground parking available. The back of the home is where the luxury is clear with a huge infinity pool and concrete patio connecting a lounge area perfect for having guests. The picturesque views are breathtaking from the outdoor entertaining space. Living in an opulent penthouse on the 77th Floor of the Trump World Tower might as well mean you’re living in heaven. Designed by Mark Cunningham and Michael Gilmore, Apartment 77B boasts vistas of the East River from inside a sophisticated collection of living spaces. Wohnhaus Am Walensee is an impressive residential project overlooking the Churfirsten mountains and one of Switzerland’s largest lakes that also names the house – Walensee. Austrian studio K_M Architektur took advantage of the unique natural setting and designed a fascinating wood and glass home that visually explores the slowly changing surroundings. Since SAOTA builds such incredible homes in stunning places, they’re part of our list with a handful of designs, like the South African Head Road 1816 residence. Located in Cape Town’s Fresnaye neighborhood, this massive modern residence is home to a young family who can now enjoy generous ocean views from inside their dream home. First Crescent Villa is another one of SAOTA‘s masterpieces built by the studio in South Africa. With an outdoor skylight, the magnificent private residence opens up to its surroundings, flooding indoor and outdoor spaces with a commanding 270 degree view of Lions Head, Camps Bay and the Atlantic Ocean. With views that could keep you still for hours and an interior design that screams luxury, we might not even notice that this home by Vertice Arquitectos bears a name that is at least boring: Beach House E-03. The contemporary Peruvian residence is located in Palillos Beach, 72 miles south of Lima and boasts unobstructed sea views – enough to consider it a dream home. Cedar shingles cover up this astounding home in the Cap-à-l’Aigle region of Charlevoix, Quebec, Canada, mixing colors and textures on a calming natural background. The Malbaie VI Marée Basse designed by Mu Architecture captures panoramas of the surrounding mountainscape and the St. Lawrence River from a collection of different vantage points. The Australian River House by MCK Architects sits above Sydney’s Lane Cove river, on a “steep and awkwardly shaped” site. This inconvenience turned out to be inspiring and result in the construction of a geometrically challenging modern home with fabulous views. Illustrious architects of Stefan Antoni Olmesdahl Truen Architects (SAOTA) design magnificent edifices, re-imagining the potential of a luxurious lifestyle on the emerging African architectural landscape. With fabulous views to support its architectural grandeur, La Grande Vue Residence in Cape Town combines the fabulous nature of a panoramic experience with the lightness of apartment living. SAOTA’s Kloof 151 project brings forth the astounding marriage between contemporary living and natural surroundings. Large covered terraces offer inspiring panoramas of Clifton beach from across the swimming pool. Coral Gables House gathers views of the Biscayne Bay from its privileged location in Coral Gables. Touzet Studio created the luxurious seaside home with its social areas oriented towards the views, so inhabitants can remember how blessed they are every time they look out the window. The inspiring result of a collaboration between the aforementioned SAOTA and OKHA Interiors, this luxurious three-level penthouse overlooks the city from the 11th floor of a building in the Sandton area of Johannesburg, South Africa. 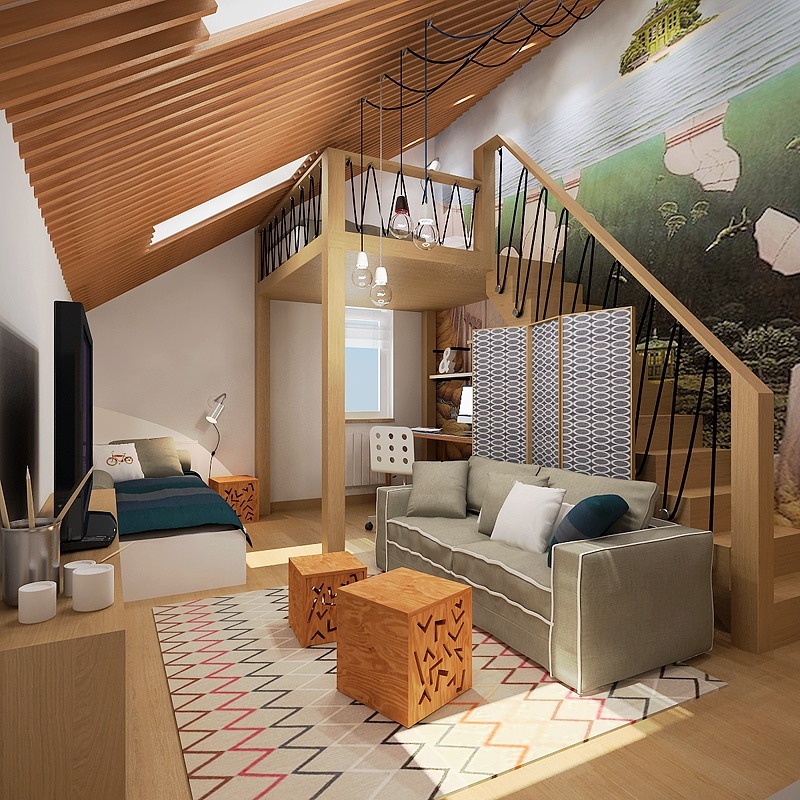 It was meant to “showcase the evolution of 21st Century urban living” while incorporating the latest technologies, making it not only an awe-inspiring residence, but also a smart home. So share your Freshome favorites and let’s make this list bigger! With expansive views of the bay, Casaprima on the hillside of Corossol in St. Barts can be rented for an unforgettable vacation. With three bedrooms and a terrace where I for one would definitely enjoy, this holiday retreat can turn a bad year into a good one almost instantly. The Indian Ocean and lush tropical mountain greenery lining its beaches provide the perfect setting for a welcoming luxury resort like the Banyan Tree Seychelles. Guests get to enjoy magnificent views of the south-western coastline of Mahé Island from inside one of the 60 Creole-style villas. Carpinteria Foothills Residence overlooks the coastal landscape of California. This modern hillside residence designed by Neumann Mendro Andrulaitis Architects is placed in an idyllic setting punctuated by mature oak trees, gathering views from both the main house and the guest house placed on a lower terrace. The last of our collection of 50 homes with the best views on Freshome is the Benelong Crescent Apartments building that lusciously slides down the hill in one of Sydney’s eastern suburb – Bellevue Hill. With a shape reminiscent of a luxurious yacht, this project designed by Australian studio Luigi Rosselli Architects offers a striking panorama over the rooftops from each floor of the apartment building. 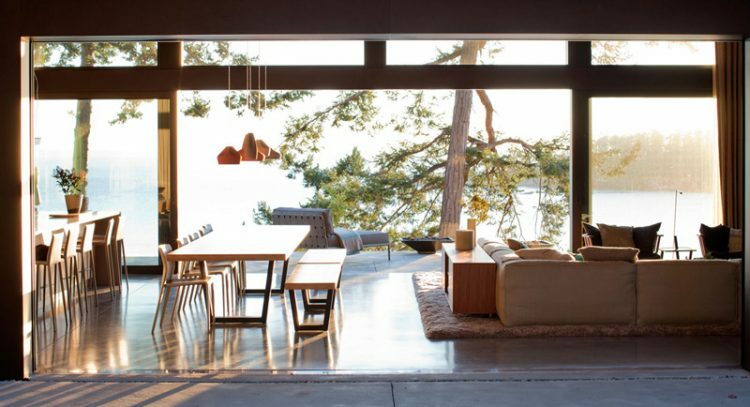 Dressed in Kabony wood, the Summer House Vestfold 2 by Jarmund / Vigsnæs AS Architects MNAL lies in the middle of a rocky landscape surrounded by water on the coast of Vestfold in the southern part of Norway – a simply stunning environment where modern life seems upgraded by the panoramas. This House on Krk Island by DVA Arhitekta flows down to the beach from its blessed location on the water, gathering views of the waterline, mountains and sky meeting in the distance. Built as a holiday retreat on Croatia’s coastline, the simple stone-cladded vacation home places the spotlight on its inspiring surroundings. With “a concept evolved from the idea of a family group camping,” Waikopua House on the Waiheke Island in New Zealand was designed by Daniel Marshall Architects. A perfectly manicured laws spreads out into the sea, overlooking the water glittering in the sun. Croatia holds an impressive collection of intriguing locations and the Golden Rays Villa takes advantage of Adriatic Sea views from the town of Primošten. The classy resort sits within a rocky hillside landscape that accentuates its potential for relaxation by visually enhancing the vacation experience. Panoramic windows offer the inhabitants of the Beck Residence by Horst Architects the opportunity to enjoy panoramas of its location: Corona del Mar, Newport Beach, California. Frameless glass walls ensure uninterrupted water and city views, complementing the serene atmosphere inside. This luxury Mallorca Villa was imagined by interior designer Julia Palmer as a simple and functional modern home with fantastic views over the Mallorcan oceanside. Soft colors accentuate the Mediterranean style, while the water itself soothes the viewer. Clifton View 7 Apartment by Antoni Associates is another stunning home in Cape Town, a double-level apartment overlooking the Atlantic Ocean. Boulders below offer the raw nature of the surroundings at the owner’s feet, while fantastic views of the Clifton beaches and the Twelve Apostles mountain range fill up the interiors with their dramatic natural language. Villa O in Cap Ferrat is not only a modern and luxurious place that can be rented, it also provides panoramic views over the peninsula while jasmine, rosemary and jacaranda trees sway in the breeze spreading their perfume across the large terraces. 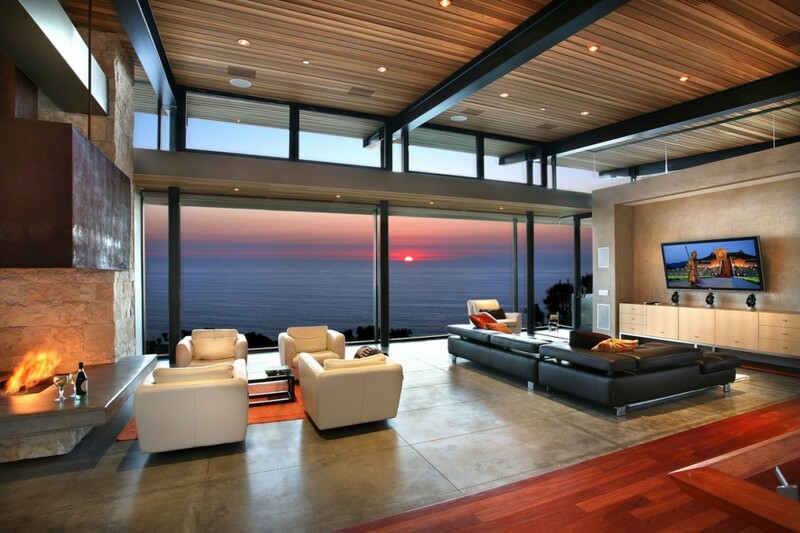 Generous interiors matched with inspiring panoramas make for unforgettable dream homes. This luxury Mallorcan villa overlooks a dramatic scenery from behind floor-to-ceiling windows and the spacious outdoor terraces. If you think living above the city is awesome, then you should check out Villa Beyond in Phuket, Thailand – an astounding modern retreat with fabulous views of the wild. Enjoying this untamed place from behind glass walls, across the infinity pool and way beyond the waters of the Andaman Sea and green vistas of Bang Tao, Villa Beyond stays true to its name. This waterfront vacation house in California has direct access to not one but two beaches, easy to reach via stairs from the bright green lawn. Exposed to fantastic views and sunsets of Point Dume, the luxurious Malibu residence boasts 80 feet of glass walls drawing the panoramas inside. The owners of some of the best homes with views decided to share their properties with others – it’s the case of the stunning Villa Kishti in Auntie Dol Bay, Anguilla, Caribbean. This luxurious holiday retreat designed by Frank Alfred Hamilton and Cecconi Simone can be rented, just don’t expect it to be cheap. An incredible five-story penthouse in Tribeca showcases how top floor properties in the Big Apple are more than your usual luxury residence – they provide a spectacular, undeniably interesting collection of views of the city that never sleeps. Can you imagine the views from above West Hollywood in Los Angeles, California? The owners of the Porter Residence designed by Abramson Teiger Architects enjoy city lights at night from their elegant home. Across the infinity pool, the city of Los Angeles sparkles bright as if trying to accentuate the feeling of being alive and differentiate itself from the constantly changing sky. Perched above the Sunset Strip, 1232 Sunset Plaza in California was designed by Belzberg Architects as a luxurious dream home with tailored floor-to-ceiling windows exposing the sophisticated interiors to an ever-changing city panorama. 9010 Hopen Place by Whipple Russell Architects is a fabulous 4,000 square foot property right above the coveted “Bird Streets” area in Los Angeles. Uninterrupted views of the city below can be enjoyed from all public and private spaces thanks to the interior courtyard opening to the sky. Within a stunning naturally rolling topography, the solitary Casa 115 in Mallorca overlooks the bay of Sant Vicenç in Pollença, Spain. Imagined as a platform for the surroundings, the home designed by Miquel Lacomba generates a sequence of unequaled panoramas. One floor is all you need when living in the city, but what if even one single floor could revive your reams of living above the city, let’s say … on the 16th floor of a circular tower in Darling Point, Sydney? 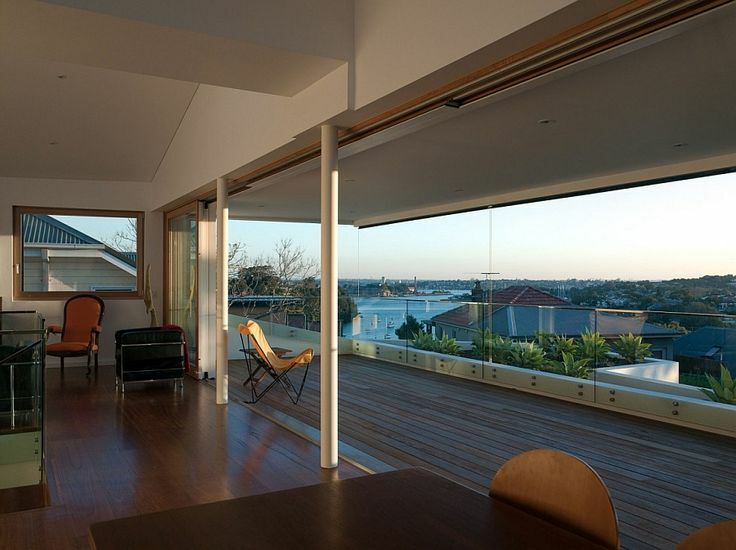 Gathering views of the harbor and Opera House, this One Floor Apartment by Stanic Harding Architecture maximizes the potential of its privileged location, leaving us in awe. The Ecomo Home by Pietro Russo combines the power of a fascinating natural landscape with the comfort of a modern lifestyle into a compact secluded dream home in Franschhoek, South Africa. After seeing our collection of as many as 50 homes with unimaginable views, we’re curious to see what other homes on Freshome inspired you with their panoramas. Nestled between rocks on Spain’s Wild Coast and overlooking the Mediterranean Sea, this spectacular modern home effortlessly breaths in the dramatic landscape while ingeniously becoming part of it through the extensive use of glazing. Leave it to Vancouver to offer amazing living platforms overlooking the city! This Fairmont Pacific Rim penthouse apartment brings an Oriental vibe through colors while visually opening the living spaces to extensive panoramas. From inside the Rabanua House, waves crushing on the boulders of Coquimbo Region, Chile, offer a constant visual and auditive spectacle. Defined by transparency, this home pictured above was designed by DX Arquitectos to take advantage of the views and adapt to the site so that the home breaths together with the ocean. 8 | The home is filled with high-end luxuries which are also environmentally friendly including heated floors, a central vacuum system, ground source heat pump, rain recycling plant, audio/visual system, programmable lighting and more. Â Again the interior design is very contemporary and slightly flashy with the chrome accents and lamps. The dining area resembles a conference room equipped with a large wall length mirror that deceives the eye and makes the space seem even larger than it really is. This mirror trick is also seen in the bedrooms and bathrooms in the home. The basement space holds a cinema room with a bright red couch, an adjacent bar, and even a raised floor which is ideal for dancing when entertaining guests. A minimalist interior design scheme allows the views to rush inside this sculptural residence known as Openhouse. Designed by XTEN Architecture, this dramatic apartment in the Hollywood Hills considers an astounding perspective over the city, leaving the interiors seamlessly connected to the outdoors. Clearhouse by Stuart Parr Design is an almost transparent dream home on the lake in Shelter Island, New York, USA. Floor-to-ceiling windows on an elevated structure gather views from all sides, composing a unique living environment. If you have $30,000,000 to spend on a staggering property, check out this luxury estate located at 188 Long Neck Point Road, Darien, Connecticut. The elegant 17-room residence built in 1897 offers Noroton Bay panoramas and distant views of Manhattan’s skyline. Victoria 73 House is yet another of SAOTA‘s masterpieces overlooking stunning views. Placed on the Eastern shores of the Atlantic, the residential project naturally blends in with its surroundings. Day beds by the infinity pool invite owners and their guests to relax and enjoy unforgettable ocean views. Anyone could get used to this seductive lifestyle. Promising incredible moments in solitude or alongside loved ones, this property designed by architect Victor Cañas and located in the province of Guanacaste, Costa Rica, sits atop a dramatic cliff and gathers views of the Pacific Ocean and its vividly green coastline. Whether exposing glittering ocean waters or visually exploring bustling city life, homes with views provoke their inhabitants to look beyond their walls and live in the moment. Soothing or energizing, panoramic views make up for more then half of an awe-inspiring collection of living spaces. 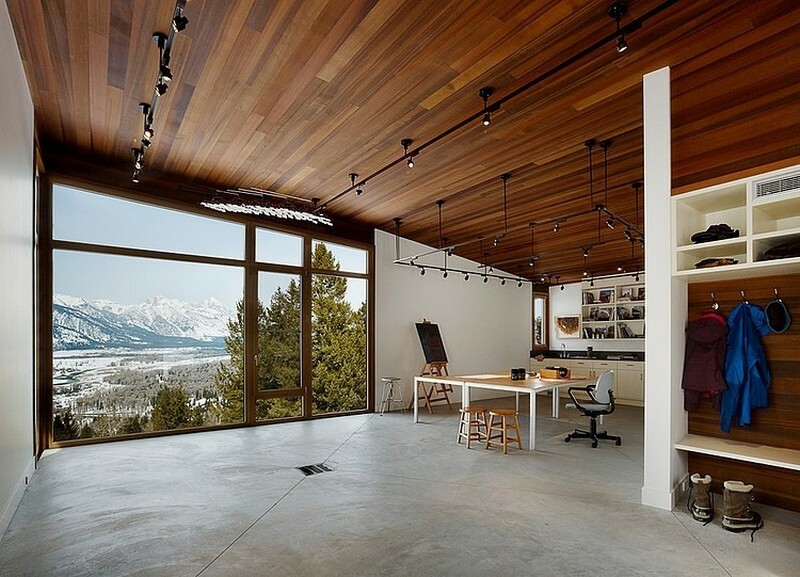 The way architects and designers capture the surrounding landscape becomes the defining trait of each home. Enjoy our list of 50 dream homes with stunning panoramas! Imagine owning a penthouse on the 50th Floor of the Ritz-Carlton residences in L.A. – did you feel a shiver down your spine? With west and south-facing views of downtown Los Angeles, this modern Penthouse from Fendi Casa defines urban luxury with its interior design and stunning city views. Some modern penthouses are nothing short of perfection, combining comfort and luxury in expansive spaces above our constantly evolving cities, others explore the whimsical effects of water views. For example, the contemporary Royal Penthouse II by Coco Republic Interior Design boasts a terrace capturing the undulating beach line below, promising an ever-changing natural serenity. 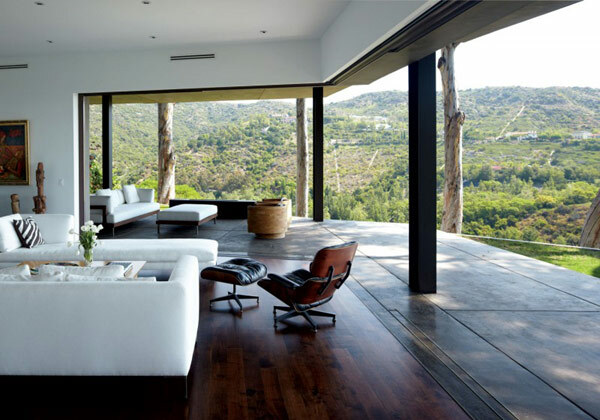 The Birdview Residence in Malibu is the result of a collaboration between Doug Burdge and Tim Clarke. Its name describes a residence overlooking beautiful beach panoramas and the immensity of the nearby ocean.